Which alloy should you use? The only alloy proven to protect your boat in fresh water! 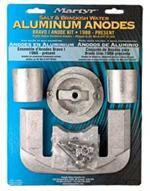 Aluminum Anode Kit for MerCruiser Bravo 1 for 1988 to present. Salt or brackish water. Magnesium Anode Kit for MerCruiser Bravo 1 for 1988 to present. Fresh water only. 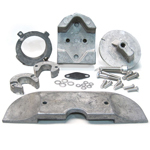 Zinc Anode Kit for MerCruiser Bravo 1 for 1988 to present. Salt water only. 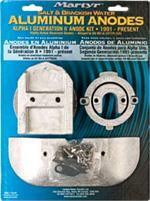 Aluminum Anode Kit for MerCruiser Alpha 1 Gen 2 1991 to present. Salt or brackish water. 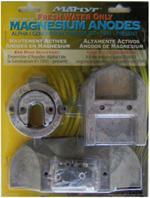 Magnesium Anode Kit for MerCruiser Alpha 1 Gen 2 1991 to present. Fresh water only. 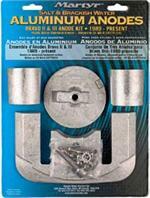 Zinc Anode Kit for MerCruiser Alpha 1 Gen 2 1991 to present. Salt water only.